Hyundai has revised its i10 citycar, a model we particularly like in its pokier 1.2-litre guise. The changes made haven't improved the thing that really needed looking at with this model - the engine efficiency - but the smarter look, the classier cabin and the improved infotainment connectivity on top models are all welcome updates. Hyundai's i10 has always been one of the citycar class laders, a position the brand needs to protect in the face of ever-toughening competition in this segment. That's why we've a facelifted version of this MK2 design so soon after this model's original 2014 launch. What the update really needed to address was the efficiency figures generated by this model's engines but that wasn't possible, so instead we've got some styling changes, an updated cabin and a class-leading dose of extra media connectivity. Wll it all be enough? Let's look at the 87PS 1.2-litre variant and find out. There are a few things you want to tick off as soon as you get yourself seated behind the wheel of a good city car. The first is visibility. If you're going to be jinking from lane to lane, you need to great all-round sightlines. This i10 scores well in that regard, with good mirrors, windscreen pillars that aren't too obtrusive and a fairly high seat height. Point two - steering. If there's one thing that instantly takes the shine off a city car it's heavy, unresponsive steering. The i10's rack is quick, accurate and very light. And the third thing you need to look for is a small turning circle - which this car certainly has. This i10 is available with a 66PS 1.0-litre three-cylinder powerplant, but we'd recommend you stretch to the 87PS 1.2-litre four cylinder unit we tried: it's quieter and just that little bit better suited to the odd longer drive. Both engines are petrol powered, because most car manufacturers have by now twigged that citycar buyers don't want to pay the extra for a diesel given that they only tend to cover modest mileages. And performance? Well, Hyundai tell us that the 1.2-litre variant will get to 62mph in 12.3 seconds and top out at 106mph but that seems fairly academic. The i10's never been about straight line go. Don't take that as meaning it's a dull drive. Ford's original Ka sold for years largely on the basis that it had no power but was great fun to pedal about in and likewise, this i10 offers keener drivers a bit of fun behind the wheel. This car is certainly a respectable size. At 3645mm long, it's just over 100mm longer than a Volkswagen Up and the i10's longer wheelbase pays dividends in the back without making it difficult to park. If you happen to own the original version of this MK2 i10 model, then you'll notice the major change made to this facelifted version immediately, the so-called 'Cascading' front grille, apparently set to bcome a signature feature on future larger Hyundai models. Around this, there's a revised bumper design and smarter round LED daytime running lights. At the rear, this improved design is also characterised by an evolved bumper design, plus re-styled rear lights. Redesigned side mouldings round off the exterior aesthetic changes. Inside, it's as you were, apart from some minor material changes. Still, not much needed altering; after all, the i10 offers best-in-class legroom and cargo capacity. There's certainly more room in the back than you might expect. Once you've entered through the wide-opening doors, you'll find a very decent level of roominess for this class of car, providing you stick with the carriage of just a couple of adults. True, the sharply rising window line might not prove popular with very small children, but they won't complain about the legroom on offer. Even with a couple of six-footers installed at the rear, front seat occupants shouldn't have to compromise space to accommodate them. Boot capacity is a supermini-style 252-litres with all seats in place. By contrast, a Skoda Citigo offers 251-litres, so Hyundai just squeaks in above the class benchmark. In the i10 range, there's a premium of around £1,000 to pay to go from the 1.0-litre engine to the 1.2-litre unit. 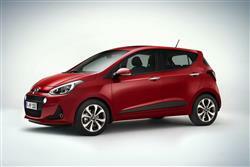 That leaves i10 1.2-litre model pricing starting at around £11,000. Go for a 1.2-litre Peugeot 108 or Citroen C1 (or indeed a pokier Volkswagen up) and you'll be paying significantly more than that. It's also worth pointing out that you have to have a 1.2-litre i10 if you want the option of paying around £500 more for an auto gearbox. If you can stretch to the plushest variant, then you'll benefits from the upgrades made to infotainment and safety technology with this facelifted design. Buyers at this end of the range now get a 7-inch colour touchscreen with Apple CarPlay and Android Auto smartphone connectivity, plus a Navigation system incorporating Hyundai's LIVE services. These give you real time traffic information, plus local weather reports, speed camera placement locations and points of interest searches. Safety-wise, upper-spec models can now be ordered with a Front Collison Warning System that automatically brakes to avoid accidents. With most variants, there's also the option of a Lane Departure Warning System. The headline efficiency figures you tend to get when you talk to Hyundai about the i10 usually relate to the eco-minded 1.0-litre 'BlueDrive' version, which manages 93g/km of CO2 and around 65mpg on the combined cycle. Unfortunately, it isn't possible to get the 'BlueDrive' tweaks with the 1.2-litre engnie, so this pokier variant delivers figures that are way off that level. Expect 57.8mpg and 114g/km of CO2, readings that are some way behind those of comparably-powerful citycar rivals. Should you specify your i10 1.2 model with automatic transmission, the figures are just 45.6mpg and 142g/km, very disappointing for a car of this sort. On the plus side, many potential owners will be attracted by the superbly comprehensive five year warranty. It's a really good unlimited miles deal that also includes annual vehicle health checks and roadside assistance to add peace of mind. After all, city driving is just about the toughest thing you can put a car through, with lots of starting, stopping, gear changing and routinely poor surfaces to put the suspension through the mill. Hyundai's i10 has a lot of very positive attributes, all of which are carried through to this revised version. It offers near-supermini standards of interior space, is good to drive, has a class-leading warranty and in its plushest form, can now feature segment-leading media connectivity too. Our only issues, particularly with the top 1.2-litre version we've been looking at here, concern efficiency. Don't get us wrong, one of these is certainly not going to cost you very much to run. It's just that rivals have set the bar higher. The automatic version in particular is worth giving a miss on this score. That issue apart, we like ths car a lot. If you're after a city scoot, it ticks a lot of boxes.